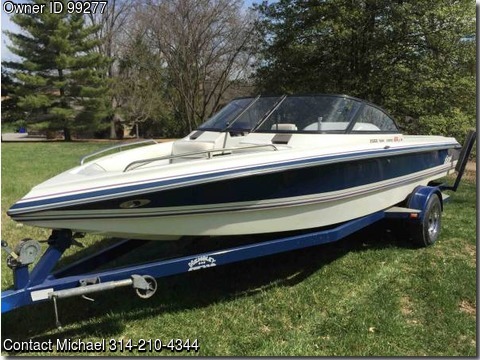 Please call boat owner Michael at 314-210-4344.Boat Location: St.
Louis, Missouri.You may not have the newest or fanciest ski boat on the lake, but in horsepower per length/weight/displacement, you will have one of the most powerful. This 20 ft inboard competition ski boat has a 400 hp big-block 454 Mercruiser multiport fuel injected engine that runs like a top. Easily lifts 4 slalom skiers out of the water simultaneously. Has 1385 well-maintained, single-owner hours. Oil, spark plugs, filters changed every year with full tuneup, detailing, and checkup of all systems. Looked after carefully for nearly its entire life by a single superb professional mechanic.Has detachable wakeboarding pole extension. Great wakeboarding and wake surfing wakes.Hull and flooring are solid. Kept indoors always.Has some upholstery issues, but overall not bad.Trailer recently repaired and in great shape.